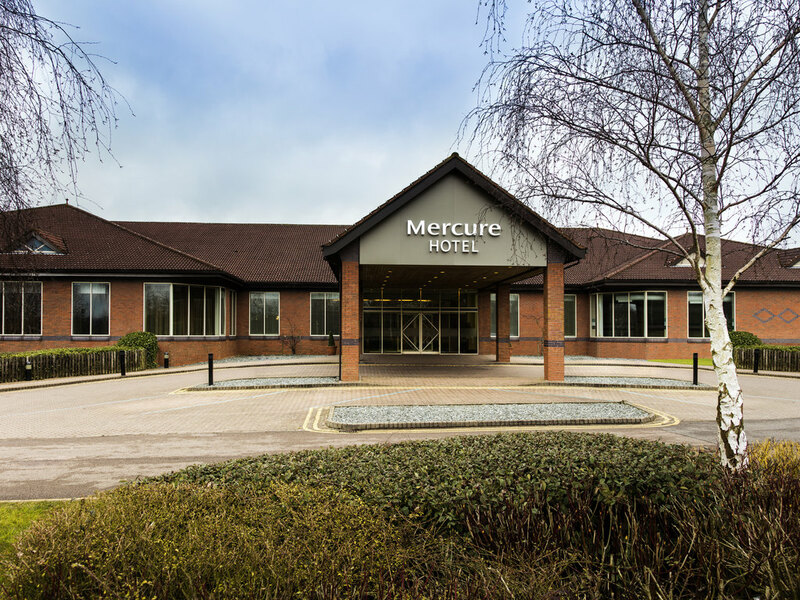 Situated nearby Drayton Water, Mercure Daventry Court Hotel is a stylish and modern 4-star hotel based in a Saxon market town. Nestled within picturesque grounds and boasting a delightful inner courtyard, this hotel is the ideal location to relax and escape. The on-site wellness centre also comes equipped with an indoor swimming pool, a sauna, a solarium and a fitness centre. Our on-site restaurants & bar offers excellent locally-sourced food, with 24-hour room service also available. Experience the finest British cuisine the region has to offer at the on-site Fuel restaurant. With a contemporary setting, guests can enjoy a variety of dining options prepared by expert chefs. Away from the hotel, an array of outdoor activities can be enjoyed including hiking, cycling and Nordic walking. The nearby surroundings and greenery make it the ideal retreat for a weekend escape. With 155 bedrooms, the hotel offers a range of accommodation including upgraded rooms, connecting rooms and enhanced accessibility. Our rooms all feature flat screen TVs and free WiFi connectivity. Our restaurant offers a variety of dining options in relaxed surroundings. Enjoy a coffee, light bite, or selection of drinks in our lounge bar. Some good, some ok, some could be better. Beautiful hotel. Very good sized rooms. Friendly staff. Lovely breakfast in the morning. Good value for money. The rooms and the breakfast were what you would expect from a hotel. Rooms & bathroom were on small side but clean and comfortable. Breakfast and service was good. I attended a conference and was disappointed by quality of food at lunchtime buffet (definitely lose cold grey fish bites)! Desert was nice. In evening at Conference dinner The steak and chips with literary 3 slices of mushrooms and no other veg, a sauce which was just gravy was very average! I am a bit disappointed if I am honest. The staff were very friendly and had no problem there. The room wasn't exactly clean, there was rust marks running from the bath taps and the sheets weren't overly clean... I do have pictures if required. I stayed with you twice in two weeks, the first week my meal took 1.5 hours for 3 courses to come out! I was compensated with a free drink to be fair..... but the standards you set and what was being view was somewhat below level :-( I ended up cancelling the second nights stay this week as I felt that I had better options elsewhere. also in the first weeks stay my TV didn't work properly. It was logged with maintenance apparently Room 276. One of the staff was kind enough to come and take a look but couldn't fix it 100% Regards Russell D.
We arrived early and had pre booked early booking in. Disappointed we had to pay £20 as group in front of us got early booking in for free. Room comfortable , although toilet flush was a bit hit and miss. The staff we did see were courteous and friendly. Room was clean and comfortable. Food was well prepared and tasty. Staff friendly and helpful. I was not expecting anything more. I was with a wedding party and happy to say that everyone else was happy with there room. However unfortunately that was mine and my girlfriends experience of our room. The toilet had not been cleaned from its previous visit or the bath being cleaned with a used bottle of shower gel in it. I am not one to moan normally but this was clearly missed or rushed when preparing the room and also no milk or milk replacement was previded and there was only one bottle of parking water and not a still. Food was terrible. Ordered a gourmet steak burger to come out as a cheap nasty “fairground” burger. Service was good. Breakfast was lovely. Nice to have use of pool and gym! Room was way too hot, dinner took ages to come out, only one waitress was doing her job properly. The room was nice and clean, the spa area very old, unclean swimming pool, out of order jacuzzi and sauna. Very disappointed in the facilities available at the hotel. Not as described. A great hotel with lovely facilities. The staff were all amazingly helpful & welcoming. Nothing was too much trouble. Pool is lovely & warm. We stayed due to attending an event at the hotel but I would definitely look to book here first if we are ever in the area again. The hotel was unbearably hot, especially the function Room and breakfast room. Food was terrible at the function and whilst better at breakfast we were unable to eat much due to feeling sick as the breakfast room was unbearable. Rooms great, service in the restaurant terrible. The room was clean and tidy. This was a business trip and I had DBB, I ate in the restaurant 3 out of the 4 nights, due to booking a table each night and once we ordered we had to wait in excess of 45 min to an hour just to receive our starter. Other table were in the same situation and between 3 different tables it was a running joke through out the stay. Other tables were getting free drinks and the 4 of us did not get anything. I did complain to the reception desk but nothing came from it. I will not be booking this hotel through my business again. Room has undergone some refurbishment, but the paint has been scratched and its clear a cheap job was done. The handles on the draws were ill fitting. The room service menu was not at all vegetarian friendly.